Responsive Search Ads allow you to create multiple headlines and descriptions and then let Google do all the optimization work for you. When the ad format first launched, we had high hopes that RSAs would allow us to get lots of stats for ad testing, easily find top combinations, and then create ETAs that were based upon huge amounts of machine learning testing. 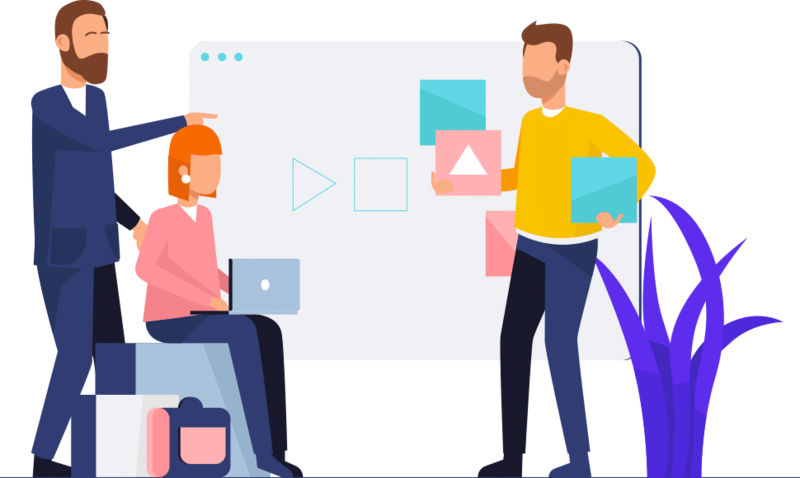 Unfortunately, none of that has come to pass and we want to walk through why that has happened and how advertisers can make the most of their ad formats. With RSAs, Google only shows your impressions by ad line or the top ad combinations. You can’t get anything but impressions from the ad formats. You can get the aggregated information for the ad, such as conversions, cost, and so forth at the ad level. But you can’t learn from them as Google doesn’t give you any detailed stats to make strategic decisions. Therefore, to really understand how RSAs are performing, we need to test them against ETAs. Because ETAs have the higher CTR, Google’s optimize setting displays RSAs more often than ETAs even though the advertiser would get more conversions if the ETA were shown most often. While individual ad group testing makes it easy to test within an ad group, we can take this further and use Multi-Ad Group Testing to see how ETAs vs RSAs preform for all the non-branded ad groups in the account. In this account, when we aggregate data by ad type, we see the exact same pattern. ETAs have fewer clicks and impressions than RSAs, but they have almost the same amount of conversions due to their higher conversion rates. This is among one of the more extreme examples we’ve seen as usually the ETA conversion rates are not more than double that of RSAs, but it does happen, and we’ll walk through why in a little bit. To get a better idea of how often RSAs and ETAs win by metrics across accounts, we did an experiment. We looked at 29 accounts that had both RSAs and ETAs in them. We took only the non-branded keywords and then looked at how often RSAs or ETAs won by CTR and conversion rates on a percentage basis across the accounts. Upon examining this data, we see that there are accounts where RSAs are doing quite well in both CTR and conversion rate. However, out of 29 accounts, RSAs won by conversion rate in more than half the ad tests a total of 5 times. RSAs did win CTR the vast majority of the time. Why Do RSAs Lose so Often? If RSAs have so much data, why do they often lose? This has to do with creating an ad that attracts the correct type of searcher and not making the ad look useful for everyone. For example, adding a call to action within an ad often increases conversion rates and lowers CTR. If someone does not want to take an action, they might not click on the ad, thus lowering CTR. Reading and clicking on a call to action can predispose a user to look for that action and therefore increasing conversion rates. The act of having a call to action can lower CTRs and increase conversion rates. That means that an ad can have 2 calls to action and no user benefits. Another ad could show 3 benefits but no calls to action. Another ad combination can show 3 features and no compelling reasons to want to interact with the ad and so forth. As some of these combinations are just trying to get clicks (what Google often focuses on) and not the ‘correct’ clicks; we often see high CTRs but low conversion rates as it wasn’t the correct users clicking on the ads and taking action. 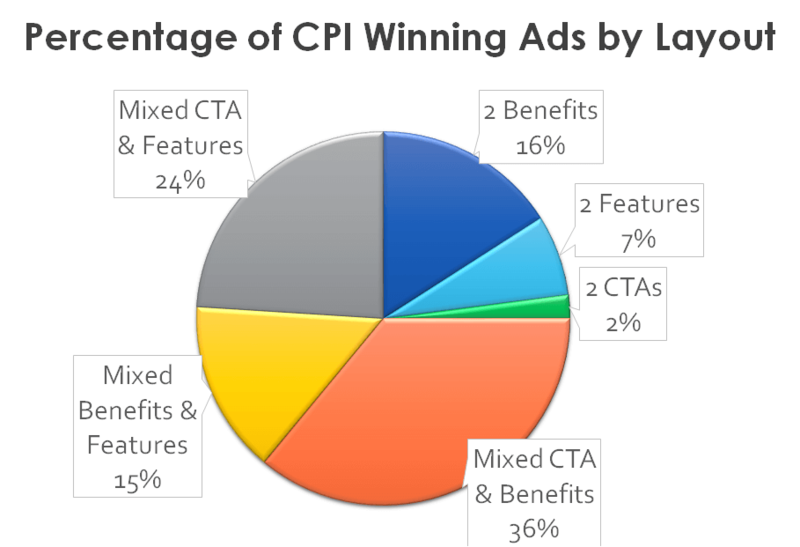 We looked through a few accounts and classified lines as CTAs, benefits, and features and looked at what combinations win by CPI (conversion per impression, which is a combination of CTR and conversion rates) to see what combinations perform the best for advertisers. Essentially, using the same ad element twice, with the exception of benefits, rarely resulted in a good ad experience for users and the advertiser. With ETAs, you can control how your ad is rendered to a user. You can ensure you are using a combination of relevant headlines, calls to action, and benefits. With RSAs, you have no control and since Google’s optimize focuses so heavily on CTR, you often end up with a lot of non-converting traffic. We’ve probably sounded pretty negative towards RSAs; however, there are times it is a good ad format to use. If you have a lot of broad keywords that are more top of funnel aligned and you just want traffic from those keywords (hopefully you are using an attribution model or monitoring engagement to ensure you aren’t wasting money); then RSAs can be useful as they do increase CTRs and can generally bring in more traffic from those broader keywords than ETAs can. If you are focused on getting converting traffic from your keywords, then ETAs generally win. If RSAs ever show us conversion stats by layout, then we might use them to quickly find the top ad layouts and convert those layouts to ETAs so we can ensure our top layouts are showing more often. That is a future possibility. As long as Google hides that crucial data, we can only look at the broad information of ETAs vs RSAs. At the moment, RSAs win CTR and ETAs win conversion rates. What’s your main account goal? Clicks or conversions? Your primary account goal should tell you which ad format is best to use and test for your own accounts. This is a super interesting analysis on these. Thanks for doing the number crunching and analysis. One thing that may help RSA’s in the future is that you can actually “pin” headlines and descriptions to have more control on where the various headlines and benefits appear. 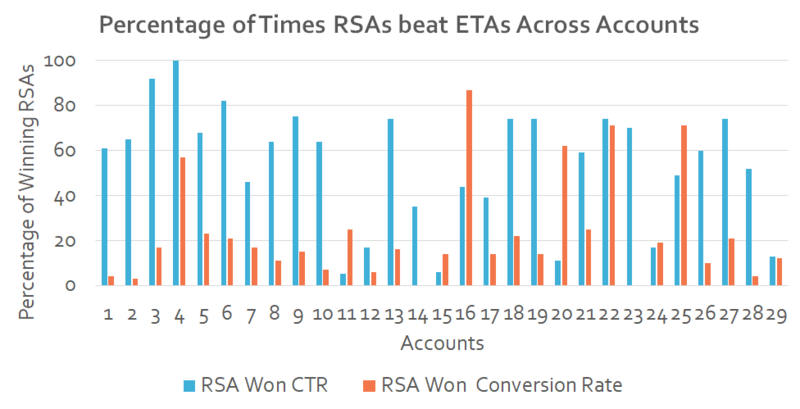 Really great insight into some of the differences in performance between RSA’s and ETA’s. However, the only caveat to this is that Google allows you to “pin” headlines and descriptions, so conceivably you could have consistent Headlines and/or descriptions and test variations based of off the “pinned” ads. So RSA’s become a bit more controllable vs. just a free for all. The reason to be careful of pinning multiple lines is that you take away the engines ability to optimize the ad. If you pin a couple of lines, then you don’t really get the benefit of RSAs, so you might as well just create ETAs so you can get a full list of all the stats to compare how they do. I’ve seen some ad groups where headline 1 & 2s are all pinned RSAs. So the headline 3 and descriptions are all that’s actually varying. In cases like that, you end up just testing a few variations so you should use ETAs in those situations and not RSAs so you have full access to detailed stats by ad combinations.